Sigung Tom Farrar have a rough start at life. By 6 years of age, he had already undergone 20 major surgeries and was not even expected to live to have them. At this same age, Sigung Tom began his journey in the martial arts. Having trained in Go Jin Ryu, Ishin Ryu, Shotokan, and Kempo, he opened his very first school at the age of 18 years in a raquetball club in Port Hueneme, CA. Concurrent to this, Sigung Tom was training in Chinese martial arts (Kung Fu) which he began at age 17. It was also in his 18th year in which he earned his 2nd degree black belt in Tae Kwon Do. From 1978 through 1979, Sigung Tom taught Kung Fu at Ojai Valley School, Villanova Prep School, and Happy Valley School. By 1983, he opened a school in Ojai and won an award in Culver City for having the largest competitive school in the region. By 1980, Sigung Tom began doing stuntwork for television. 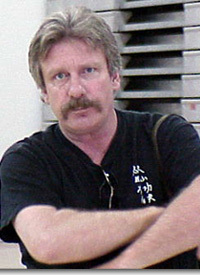 He went on to work in special effects and set-building and by 1984, he had shot and produced "Self Defense for Everyone" as well as co-hosting with Lisa Lew. This production featured martial artists such as James Lew, Gerald Okumura, Darrell Goodan (Sigung Darrell), and Rufigio Flores along with Sigung Tom himself. In the mid eighties, Sigung Tom had relocated to Vail, Colorado where he opened a school and became head of security for the local division of a major hotel chain. Along with this, he was also a bouncer and was called upon to train other bouncers in self defense and "cooling" techniques. These "cooling" techniques were ways in which to eliminate threats without leaving marks on disruptive patrons as well as to alleviate liability issues and to get problems outside of the establishment as soon as possible. Later in the eighties, Sigung Tom moved back to Mammoth, California. Here, he taught privately and bounced at popular locales as well as bouncing in Ventura, California. Eventually, Sigung Tom came home to southern California and from 1988-1990, he worked in television and music videos while teaching privately and offering protective services and body-guard work for high-profile clients. Later, one such client was David Carradine (perhaps best known as Caine in the "Kung Fu" series or as Bill of "Kill Bill" fame) during his work on the film "The Bitter End" (1993). In fact, Sigung Tom has a role in this film! It was also during this time that he coached girls soccer and taught privately in Filmore, California. Finally Sigung Tom opened this very school, The Mountain Institute for Kung Fu and Tai Chi, in 1999 with Sigung Darrell Goodan and Claire Farrar. In 2002, the school became a not-for-profit organization. Even though Sigung Tom continued to undergo three more major surgeries between 2002-2004, he managed to take his school to China in 2000, 2002, 2004, and 2007. In fact, earlier in 2007 before the trip to Beijing, Sigung Tom underwent major surgery for a blood clot that ran from his hip to his ankle, yet he continued to teach and did not miss this trip for his students. In 2006, Sigung Tom was inducted into the International Martial Arts Hall of Fame. Sigung Tom Farrar teaches students of all walks of life regardless of age, gender, religion, race, etc. He dedicates himself to students as young as 5 and has great after school programs and teaches adults as well. 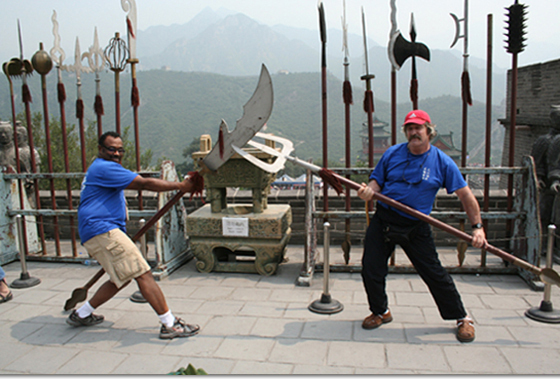 Not only are martial arts taught at The Mountain Institute for Kung Fu and Tai Chi, but also fundamentals and aspects of Chinese culture and philosophies. Some of his students have gone on to successful careers in the military, Mandarin linguists, and foreign trade. Sigung Tom's instructors include Hing Chong Lee (Howard Lee) of the Canton Opera, Zhang Yang Tao, and Wing Lam.